•How did they get your key? substantially with each extra minute they take to break into a home. home, they may decide it isn't worth the risk! your key. You need keys that you can be confident won't turn up in the wrong hands. 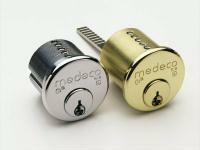 Medeco's patented Medeco3 system means it's virtually impossible for someone to get a copy of your keys without your permission. Only Medeco security professionals are authorized to copy your key, and they can only do so with your consent. Trust Medeco. Key control is our business. We are the industry standard! •Solid brass construction secured with high-tensile steel bolts. 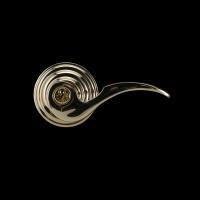 brass construction and is available in an assortment of beautiful finishes and functions. and durable finishes ensure long life and lasting beauty. be masterkeyed for maximum flexibility. The Cambria is available with an interior knob or lever, high security rim cylinder, and in a host of finishes. 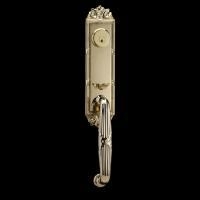 The solid brass lever is a beautiful complement to the Maxum deadbolt, or as a stand alone locking lever. detail. Its smooth operation and beautiful finishes will enhance any entry. 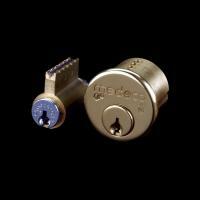 like all Medeco Residential locks, can be masterkeyed for maximum flexibility. U.L. 437 rated key system. 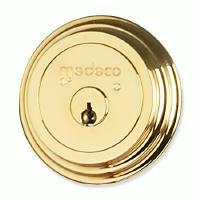 Its solid brass construction combines superior durability with the utmost in elegance and security. 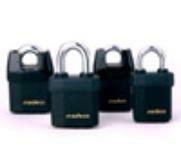 The lockset chassis is constructed of heavy gauge, cold-rolled steel. The retractor is cast stainless steel with bronze roller bearings to provide high strength and smooth operation. All parts are plated to resist rust and corrosion. manufacturer including single and multi-point lock mechanisms as well as some premium storm/screen doors. 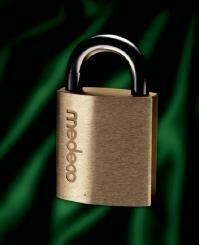 nearly any major residential hardware manufacturer and still enjoy the peace of mind of having Medeco security. 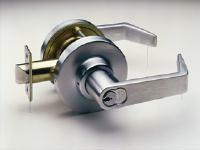 Residential locks, can be masterkeyed for maximum flexibility. secure. Tara features a high-quality solid brass construction and is available in an assortment of beautiful finishes and styles. and with the incorporation of the reciprocal slider mechanism, further enhance the cylinder's pick resistance. resistance is provided by hardened steel rods inside the bottom pins and selective use of hardened steel top pins. accurately reproduce the critical angled cuts on a Medeco key. drooping or failure, thanks to the heavy duty spring pack which eliminates loose levers. torque applied to the outside lever. 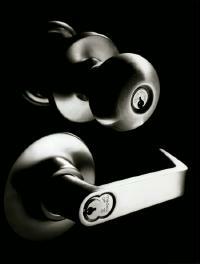 •The Embassy lever locksets are built with reliability, accessibility for servicing, and long life durability in mind. resist hacksaws and bolt cutters. action resists forcing of shackle. system is virtually pick proof. designed to last the life of your equipment. protects against cutting and pulling attacks. 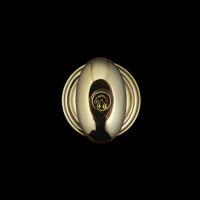 in the satin brass finish.